In the Fall of 1933 a Nor'easter cut a new inlet through the beach at the south end of Ocean City, Maryland, opening one of the finest fishing ports on the Atlantic Seaboard. Three years later, in July, 1936, Paul Townsend pioneered the waters offshore and located great numbers of white marlin, establishing this area as the focal point in the middle Atlantic for the concentration of these great fish. In 1937 a group of Washington anglers, James O'Donnell, Jr., Alan Ferguson, John F. Kerkam, Henry A. 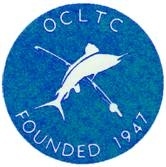 (Bob) Gardner, Jr., A. Murray Preston, Robert Avery, Frank Weller and H. P. Gatley, began fishing extensively out of Ocean City, and the foundations of the Ocean City Light Tackle Club were laid. They fished originally with 9 and 15 thread (rating: 3 lbs per thread) but soon concluded that the lighter tackle was better suited to the species. By the end of the 1938 season all of them were fishing exclusively with light tackle, i.e., 6 ounce tip and 9 thread linen line, Messrs. O'Donnell and Ferguson leading the trend to lighter gear.They also initiated the practice of releasing white marlin at Ocean City, thus establishing it as the first port on the Atlantic where general releasing of marlin was practiced. In August of 1940, Alan Ferguson took a white marlin of 1141/2 pounds on 6/9, setting a new world's record for the species on 9 thread and bringing Ocean City its first world's record. This catch was an inspiration to anglers and captains and clearly established 6/9 as the proper tackle for these fish. Their fishing was interrupted by World War II, but at the end of the war, they returned with other angling friends and reinitiated the program of light tackle and conservation. They banded together and drafted a Constitution and bylaws, dedicating themselves to the principles of conservation and the use of proper tackle for white marlin. The original officers, elected at the first meeting on January 8, 1947, were: President, Alan M. Ferguson; Vice President, James O'Donnell, Jr.; and Secretary, John F. Kerkam. During the fi rst year of its existence the following additional members were added: Reginald H. Foster, Harry R. Fowler, B. Tiffany Doane, Louis S. Allen, John E. Larson, Thomas Healy, Joseph True and W. Barney Harris.